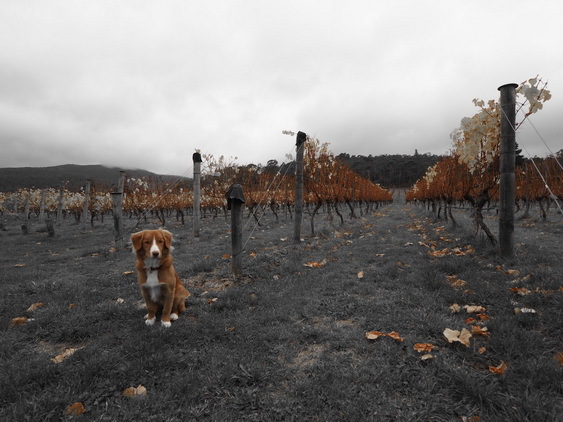 Two Bud Spur is a small vineyard in Tasmania’s Huon Valley; the most southerly wine region in Australia. Our vines were planted in 1996 on a premium north facing site in Gardners Bay, Tasmania. The vineyard was purchased by marine biologists Craig Mundy and Karen Miller in August, 2006 and we released our first wines under our new Two Bud Spur Label in 2007. Over the last twelve years we’ve taken what was a neglected site and through hard work, blood, sweat (and the odd tear), we’ve resurrected Two Bud Spur to its former glory. As scientists we tend to over-think everything we do in the vineyard and winery, and although it gives us extra grey hairs, we think the wines are better for it. Generally the wine-show judges agree, and we’ve been awarded more than 15 medals for our wines so far. Two Bud Spur is our passion and we love sharing it with others. You’ll find us in the vineyard or cellar door most weekends, helped out by our trusty wine-dogs Rose and Rupert who love visitors probably even more than we do! We have just over 2ha of vines with five grape varieties: Pinot Noir, Chardonnay, Sauvignon Blanc, Gewürztraminer and Gamay. The vineyard is planted on a gentle north-facing slope and receives all-day sun. Shallow soils overlay a clay base, with a junction between dolerite and mudstone in the middle of the vineyard, providing ideal “terroir” for our cool climate varieties. At Two Bud Spur Vineyard we strive to minimise our ecological impact and ensure we consider the broader environmental consequences of everything we do. We use conservative irrigation to minimise wastage, supplementing natural rainfall with around 0.2 megalitres/hectare annually. Our vines are drip irrigated and we use ground water for irrigation in preference to dam-storage, to reduce loss through evaporation. Our bore-water is treated with environmentally friendly Hydrosmart technology. We nurture our soil through on-site production of mulches and we consciously choose biodegradable products for use in the vineyard. More than half of Two Bud Spur Vineyard is dedicated to regenerating forest, providing habitat for native wildlife. No synthetic pesticides are used in the vineyard. We keep the rampant weeds (mostly) under control with our fantastic undervine mower, which eliminates the need for herbicides. To control disease we focus on careful canopy management and use a mix of organic and synthetic fungicides chosen on the basis of their environmental life cycle, targeting naturally derived products wherever possible. We also consider simple things such as using local products; and in reality most of our wine is consumed within a 50km radius of the vineyard which appeals to our “locavore” tendencies. All our wine is packaged in Australian-made bottles, our paper is recycled and although we realise we’re not perfect, we are actively working towards reducing our carbon footprint and making a difference in this consumer-driven world we live in. Our focus on minimising environmental impact is also evident in our glorious straw bale winery and cellar door – come and visit to see for yourself!